In February 1941 he was appointed assistant head of foreign intelligence. He was sent to China with the task of resuming contact with Walter Stennes, who was a German military advisor to Chiang Kai-shek (the leader of Kuomintang) and the head of his security guard. Stennis, a former leader of the Sturmabteilung (SA) told Zarubin that he was in possession of information on Hitler’s preparations for the attack against the USSR and indicated that it was to be launched in May-June, 1941. (6) After Operation Barbarossa Zarubin helped to establish anti-fascist resistance groups to fight the German Army. The letter also accused Zarubin of being a Japanese agent and his wife was working for Nazi Germany. Zarubin was also accused of being involved in Katyn Forest Massacre and was "interrogated and shot Poles in Kozelsk, Mironov in Starobelsk". The writer went on to describe a large network of Soviet agents, "among whom are many U.S. citizens". He named Earl Browder and Boris Morros. He also claimed that a "high-level agent in the White House" (this was probably Lauchlin Currie). The FBI believed the letter was genuine and carried out surveillance on Zarubin and other Soviet operatives mentioned in the letter. Vassili Zarubin died in 1972. Using funds provided by the NKGB, Morros would establish a music publishing house in the United States - a business that could also serve as a cover for Soviet illegals. 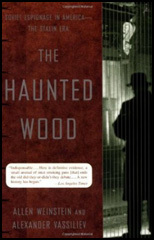 Since Moscow could not provide funds for such a project at the time, Zarubin approached "the Red millionaire," Martha Dodd's husband, Alfred Stern ("Louis"). Zarubin's superiors in Moscow endorsed the project and assigned the code name "Chord." Soviet intelligence's adventure in the American commercial music industry was launched at a September 1944 meeting of Morros and Stern brokered by Zarubin. The enterprise that unfolded resembled the classic film comedy The Producers, substituting for that movie's famous song line ("Springtime for Hitler and Germany") a chorus of "Autumn for Stalin and Motherland." Zarubin described the venture's opening phase to Vsevolod Merkulov in Moscow: "At the first meeting ... we discussed all the questions of principle. I repeated once more that (Stern) wouldn't have the right to interfere in ( "Chord's") operational and commercial essence.... Afterward, the lawyers drew up an agreement"
The New York station chief became enmeshed in the project's "operational and commercial essence." Zarubin told Merkulov that plans for the company already underway, led by the energetic Boris Morros, included contests involving South American composers, with the winners and best works signed to contracts, and negotiations with well-known conductors Leopold Stokowski and (in Paris) Serge Koussevitzky for purchasing their works. Morros had already acquired record production equipment for a Los Angeles plant he intended to purchase. In addition, he had already begun to promote the new company to broadcasting networks, orchestras, and motion picture studios: "In fact," Zarubin proudly informed his Moscow colleague, "Chord has already begun practical activities.... Financially, it will be ready this winter for use as a cover but, if we needed it even earlier... we could send people under Chord's flag right now." It was at this party that I learned for the first time of the relationship between Helen and Peter. Peter was Helen's husband! Helen had come back aglow from a successful mission, judging by the many toasts that were made to her health. Peter, rather high, was enamored with her, and when I said, something like, "You show good taste in women, Peter," he could hardly stop rolling with laughter. Between gasps, he said, "That's a good one! She's been my wife for over ten years and the mother of my son! You must come and meet our son!" In the many, many meetings we had had, never was there an indication of this relationship. It added one more feature to the conspiratorial setup. In time I was to learn that her name was Elizabeth Zarubin; that she and her husband, Vassili Zarubin, had been stationed in the United States in the early 1930's and returned during the war years when Zarubin occupied various Soviet Consulate and Embassy posts. In Moscow I would realize that they were top-shelf officials of the GPU, or the NKVD, as it had meanwhile been renamed. The food and drink at such parties was superb and always too abundant. The procedure the same. Very much to drink, rapid toasting for all sorts of reasons, very much to eat, and singing until the early morning hours. They are a gifted people, the Russians, and they can sing! Peter would take his place in the center of a room and strum his balalaika tirelessly, singing in a strong, natural voice the long, sad Russian folk ballads, or gay, naughty stanzas with a wicked grin on his face; at the end were always the Red Army songs. At such parties he looked like a simple Russian peasant, blond, blue-eyed, happy. I could not help but think that without the Bolsheviks, he might have been just that. In 1942-43 the New York rezidentura was ruled by the unpopular and bombastic Major-General Vasili M. Zarubin (MAXIM) who operated from January 1942 under the nom-de-guerre Zubilin with the rank of third (later second) secretary, and was married to the shrewd Elizaveta (VARDO) who held the rank of colonel. Originally from Bukovina in Romania, Elizaveta had a degree in philology, and spoke several languages, including French, German, English and her native Romanian. According to her declassified KGB file, she had been recalled from Germany in April 1941 to cultivate the wife of a senior German diplomat in Moscow, and later successfully ran a code-clerk in the German Foreign Ministry. Zubilin, who had been a banker in Moscow before he joined the NKVD, had worked under diplomatic cover at the Soviet embassy in China, and was believed to have been implicated in the massacre in 1939 of thousands of Polish officers at Kozielsk in the Katyn woods. In late 1943 Zubilin was replaced by Stepan Apresyan (MAY), and was transferred to Washington DC, where he initiated direct communications with Moscow, eliminating the necessity of relaying them via New York. The Zarubins stayed in Washington only briefly because, as a result of a false allegation made by Vasili's secretary, Colonel Mironov, the rezident and his wife were recalled to Moscow at the end of August 1944 to face a lengthy investigation. 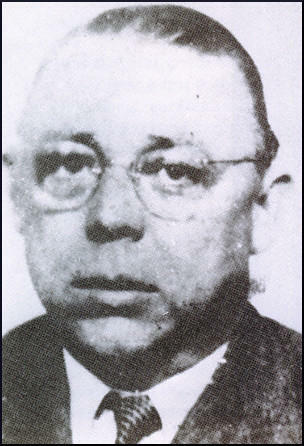 In March 1943 Leonid R. Kvasnikov (ANTON) was sent to New York to establish a separate rezidentura on behalf of the 8th Department and concentrate on collecting information about the Anglo-American atomic bomb programme, which he accomplished until his hasty withdrawal in October 1945. On August 7, 1943, the director of the FBI received an anonymous letter written in Russian. 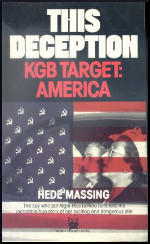 It purported to name leading KGB officers operating under diplomatic cover in Soviet offices in the United States, Canada, and Mexico and charged that they were engaged in espionage on a broad scale. The letter stated that the chief KGB officer in the United States was Vasily Zubilin, that Zubilin's real name was Zarubin, and that his wife, Elizabeth, was also a KGB field officer running her own network of American sources. Other KGB officers named in the letter were Pavel Klarin and Semyon Semenov, officials at the Soviet consulate in New York; Vasily Dolgov and Vasily Mironov, officials at the Soviet embassy in Washington; Grigory Kheifets, Soviet vice-consul in San Francisco; Leonid Kvasnikov, an engineer with Amtorg; Andrey Shevchenko and Sergey Lukianov, officials with the Soviet Government Purchasing Commission; Vladimir Pavlov, second secretary of the Soviet embassy in Canada; and Lev Tarasov, a diplomat at the Soviet embassy in Mexico. The FBI was, not surprisingly, perplexed by the letter and suspicious that it was a fraud. But an investigation of the activities of the Soviet diplomatic personnel named in the letter quickly convinced the bureau that they probably were indeed Soviet intelligence officers. Years later, the deciphered Venona messages further confirmed the accuracy of the identifications provided in the letter. The motive behind the letter was clear: the anonymous author hated Vasily Zubilin and accused him of a variety of sins, including participating in the murder of thousands of Polish prisoners of war in the Katyn forest. This last accusation caught the attention of American authorities because at that time they were not sure what had happened at Katyn, and out of nowhere came a letter asserting inside knowledge about one of the participants in the Katyn action. Only a few months earlier, the German government had announced that it had uncovered a mass grave containing the bodies of thousands of executed Polish military officers in the Katyn forest near Smolensk, on Soviet territory overrun by Nazi forces. According to the Nazis, the Soviet Union had captured these Poles in 1939 when it conquered eastern Poland under the terms of the Nazi-Soviet Pact. The USSR blamed the mass murder on the Nazis, saying that the Germans had captured the Poles alive when they overran Soviet prisoner-of-war camps and had subsequently murdered them. In fact, the Soviets had murdered the Poles: on March 5, 1940, Stalin ordered the KGB to shoot 14,700 Polish prisoners of war. The anonymous letter also correctly asserted that Zubilin had some role in the KGB's Katyn operation. The FBI had no way to verify it at the time, but eventually the Venona Project deciphered a KGB cable in which Zubilin himself confirmed having played a role. On July 1, 1943, he reported to Moscow that he thought he had noticed surveillance of his activities by a hostile intelligence agency and speculated that it had found out about his 1940 service at one of the camps at which the Poles had been murdered. But while the claim that Zubilin had taken part in the Katyn massacre was accurate, the letter also contained the outlandish claim that he had betrayed the Soviet Union and was spying on the United States in the service of Japan. It urged American authorities to reveal Zubilin's treachery to Soviet authorities and asserted that when his betrayal was revealed, one of the other KGB officers, Vasily Mironov, would surely execute Zubilin on the spot. Mironov, nominally a Soviet diplomat, was described as a patriotic KGB colonel who hated Zubilin. The FBI suspected that the author of the anonymous letter was a disgruntled KGB officer, but it was never sure of his identity. A passage in the 1994 memoir of a retired KGB general, Pavel Sudoplatov, suggests that Mironov wrote the letter. Sudoplatov, who held a headquarters role in KGB foreign intelligence operations during World War II, states that Mironov, a KGB lieutenant colonel, had sent a letter to Stalin denouncing Zarubin (the anonymous letter was correct about Zubilin's real name) as a double agent. Mironov's letter caused Zarubin's recall to Moscow. The investigation against him and Elizabeth lasted six months and established that all his contacts were legitimate and valuable, and that he was not working with the FBI. Mironov was recalled from Washington and arrested on charges of slander, but when he was put on trial, it was discovered that he was schizophrenic. He was hospitalized and discharged from the service. Given the closeness of the British-American "special relationship", the Centre inevitably suspected that some of the President's advisers sympathized with Churchill's supposed anti-Soviet plots. Suspicions of Roosevelt himself, however, were never as intense as those of Churchill. Nor did the Centre form conspiracy theories about its American agents as preposterous as those about the Cambridge Five. Perhaps because the NKVD had penetrated OSS from the moment of its foundation, it was less inclined to believe that United States intelligence was running a system of deception which compared with the supposed use of the Five by the British. The CPUSA's assistance in the operation to assassinate Trotsky, combined with the enthusiasm with which it "exposed and weeded out spies and traitors", appeared to make its underground section a reliable recruiting ground. 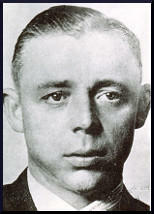 Vasili Zarubin's regular contacts with the CPUSA leader, Earl Browder, plainly convinced him of the reliability of those covert Party members who agreed to provide secret intelligence. By the spring of 1943, however, the Centre was worried about the security of its large and expanding American agent network. Zarubin became increasingly incautious both in his meetings with Party leaders and in arranging for the payment to them of secret subsidies from Moscow. One of the files noted by Mitrokhin records censoriously, "Without the approval of the Central Committee, Zarubin crudely violated the rules of clandestinity." On one occasion Browder asked Zarubin to deliver Soviet money personally to the Communist underground organization in Chicago; the implication in the KGB file is that he agreed. On another occasion, in April 1943, Zarubin travelled to California for a secret meeting with Steve Nelson, who ran a secret control commission to seek out informants and spies in the Californian branch of the Communist Party, but failed to find Nelson's home. Only on a second visit did he succeed in delivering the money. On this occasion, however, the meeting was bugged by the FBI which had placed listening devices in Nelson's home. The Soviet ambassador in Washington was told confidentially by none other than Roosevelt's adviser, Harry Hopkins, that a member of his embassy had been detected passing money to a Communist in California. Though Zarubin became somewhat more discreet after this "friendly warning", his cover had been blown. Worse was yet to come. Four months later Zarubin was secretly denounced to the FBI by Vasili Mironov, a senior officer in the New York residency who had earlier appealed unsuccessfully to the Centre for Zarubin's recall. In an extraordinary anonymous letter to Hoover on 7 August 1943, Mironov identified Zarubin and ten other leading members of residencies operating under diplomatic cover in the United States, himself included, as Soviet intelligence officers. He also revealed that Browder was closely involved with Soviet espionage and identified the Hollywood producer Boris Morros (FROST) as a Soviet agent. Mironov's motives derived partly from personal loathing for Zarubin himself. He told Hoover, speaking of himself in the third person, that Zarubin and Mironov "both hate each other". Mironov also appears to have been tortured by a sense of guilt for his part in the NKVD's massacre of the Polish officer corps in 1940. Zarubin, he told Hoover, "interrogated and shot Poles in Kozelsk, Mironov in Starobelsk". (In reality, though Zarubin did interrogate some of the Polish officers, he does not appear to have been directly involved in their execution.) But there are also clear signs in Mironov's letter, if not of mental illness, at least of the paranoid mind set generated by the Terror. He accused Zarubin of being a Japanese agent and his wife of working for Germany, and concluded bizarrely: "If you prove to Mironov that Z is working for the Germans and Japanese, he will immediately shoot him without a trial, as he too holds a very high post in the NKVD. By the time Mironov's extraordinary denunciation reached the FBl, Zarubin had moved from New York to become resident in Washington - a move probably prompted by the steady growth in intelligence of all kinds from within the Roosevelt administration. As the senior NKVD officer in the United States, Zarubin retained overall control in Washington of the work of the New York and San Francisco residencies; responsibility for liaison with the head of the CPUSA, Browder, and with the head of the illegal residency, Akhmerov; and direct control of some of his favourite agents, among them the French politician Pierre Cot and the British intelligence officer Cedric Belfrage, whom he took over from Golos. Vassili Zubilin - alias Zarubin, alias Luchenko, alias Peter, alias Cooper, alias Edward Joseph Herbert - was another character from the shadows. All evidence pointed to the notion that he became the chief KGB resident in the United States after Ovakimian's departure. Zubilin and his wife, Elizabetha, were veteran KGB officers whose espionage activities dated back to the 1920s and had taken them all over the world. Zubilin was stocky and blond, with a broad-featured face and a manner that, according to those who had dealt with him, could be alternately pleasant and menacing. He operated from a position as third secretary of the Russian embassy in Washington. As to his exploits, he seems to have been more of a "fixer" than Ovakimian, but perhaps this is because it was in this role that the FBI had caught more glimpses of him. We knew people who had worked with him at various times in Hollywood, San Francisco, New York and Washington. He was involved in everything from using a film company as a front to funnel money to clandestine activities, to attempted atomic espionage. Zubilin's personality seems to have been more outgoing and less cerebral than Ovakimian's - but both men survived the purges. Zubilin's name cropped up in a number of cases, and during my time in New York we charted his comings and goings and tailed him when the manpower was available. We tried to learn what he was doing; most of the time we didn't know. In later years, after he had left the United States, we heard that he had been made a general in the KGB, and that he had died an alcoholic. Trying to counter the work of Ovakimian and Zubilin was a task full of frustration and repeated failures, with only occasional and partial successes-a pattern reflective of the difficulties the FBI experienced in fighting the KGB at the outset of the postwar period. In this intense but nearly invisible combat, counterintelligence was playing catch-up ball; the Soviets had built up an early lead and the FBI, new to the endeavor, was not as knowledgeable or as sophisticated as the enemy. One evening in 1946 my friend Emory Gregg and I were bemoaning the fact that although we knew the top GRU man in New York (Pavel Mikhailov, the consul general), we had not been able to identify the leading KGB agents. Emory and I were aggressive and young, and had a lot of ideas for actions the Bureau ought to be taking against the KGB, but we didn't have much clout within the organization because we were just foot soldiers. This night we resolved to try something new. The FBI thought that the U.S. headquarters for the KGB was in the Soviet consulate on East Sixty-first Street, a block off Central Park, and believed that the top KGB man, called the "resident," was in that consulate. Our knowledge of the Soviet espionage system suggested that while strings were ultimately pulled from Moscow, the New York resident had the power to develop targets of espionage, to enforce discipline within his own ranks and to insist on full reports from subordinates. Under the resident's direction, coded cables would be sent to Moscow (more bulky papers went in a section of the diplomatic pouch), and at his behest logs were maintained which noted the location and substance of all meetings between espionage agents and recruits. We knew a lot about the resident's job, but we didn't know his identity.